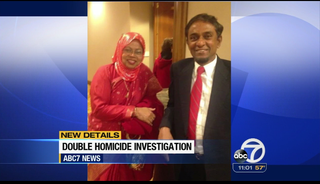 Golam and Shabiba Rabbi, 57 and 59, emigrated from Bangladesh decades ago and were active members of the Evergreen Islamic Center, but it’s unclear if their religion or nationality had anything to do with the crime. A relative told the San Jose Mercury News one of their sons has been taken in for questioning. An unnamed source told ABC 7 about the supposed note on the floor, which police haven’t publicly confirmed. The couple reportedly have two sons, aged 17 and 23. It’s unclear which son was supposedly taken into custody, but the other son’s whereabouts were unknown, the same relative told the newspaper. Golam, a hunting enthusiast, reportedly kept several guns in the home. The South Bay Islamic Association posted a note announcing the Rabbis’ death and identifying them as active members of both the Evergreen Center and the SBIA. Funeral plans haven’t yet been announced. Including the Rabbis, there have been five separate homicides in San Jose over the past week.